distribution DISTRIBUTION: This species was described only in early 2014, with specimen review and determinations made only in March 2014. So far it is known from specimens and photos only in the state's lower Coastal Plain, north to Jones and Craven counties. As it occurs farther southward to FL, it certainly must occur in counties between these and the SC border, if not farther inland. No records are known from the Piedmont as yet (based on recent specimen determinations). flight FLIGHT PERIOD: Completely unknown, but likely several broods from March into October, similar to that of the Carolina Satyr. The specimen and photo records for NC are from May 2 and from August 12 - September 1, though certainly this isn't meaningful in terms of the spread of flight dates, other than clearly representing two broods (if not more). habitat HABITAT: Mesic to moist hardwood or mixed forests, overlapping habitats used by Carolina Satyrs. The site in Jones County is known to be quite rich and on high pH soils, but there are too few records to suggest there is a relationship with high pH soils. It is known that Carolinas occur over a much wider range of sites (and probably habitats) in NC than do Intricates, based on photos taken by Brian Bockhahn across much of the Coastal Plain. Carolinas likely range into wetter sites than do Intricates; Intricates may prefer sites with a more diverse grass layer. plants FOOD AND NECTAR PLANTS: Observations by Tom Austin in SC suggest that rosette grasses (genus Dichanthelium) are a primary host plant for the species there. At the Jones County site, longleaf spikegrass (Chasmanthium sessiliflorum) is abundant and is the most conspicuous grass there; thus, it is a suspected host plant. However, it was not determined whether rosette grasses are present at the Jones County site and, if so, how abundant they are. 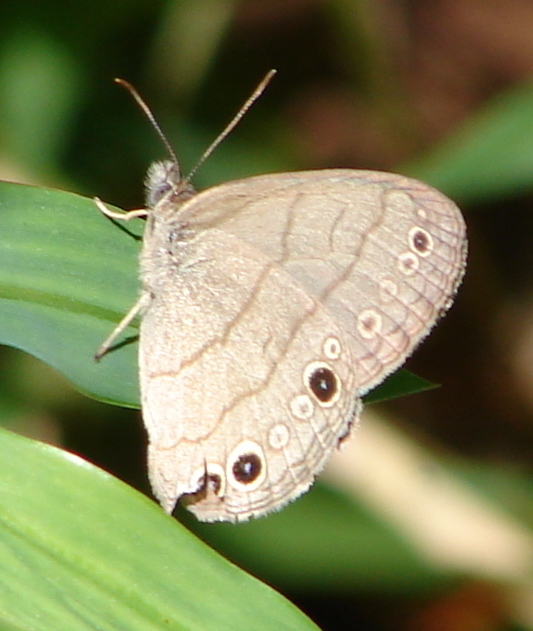 Nothing is yet reported on nectar plants or amount of nectaring, though the Carolina Satyr only infrequenty is found at flowers. comments COMMENTS: The paper describing the Intricate Satyr, and a second new satyr from TX into MX, only came out in early 2014 (Zookeys  43-91), by Cong and Grishin. Unfortunately, many references do not accept this species as valid, including NatureServe. 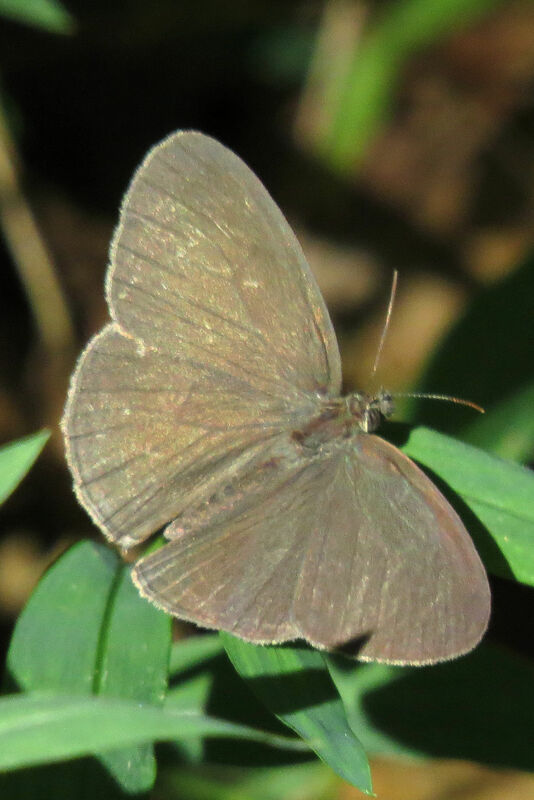 Warren has found that male specimens of Intricate Satyr in the FL collection (based on genitalia) have the upper wing surface evenly colored brown, if not slightly darker toward the margin than toward the base. 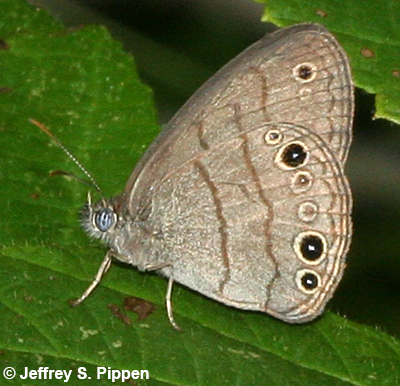 In general, Carolina Satyr specimens tend to be slightly paler around and near the margins and slightly darker at the bases. 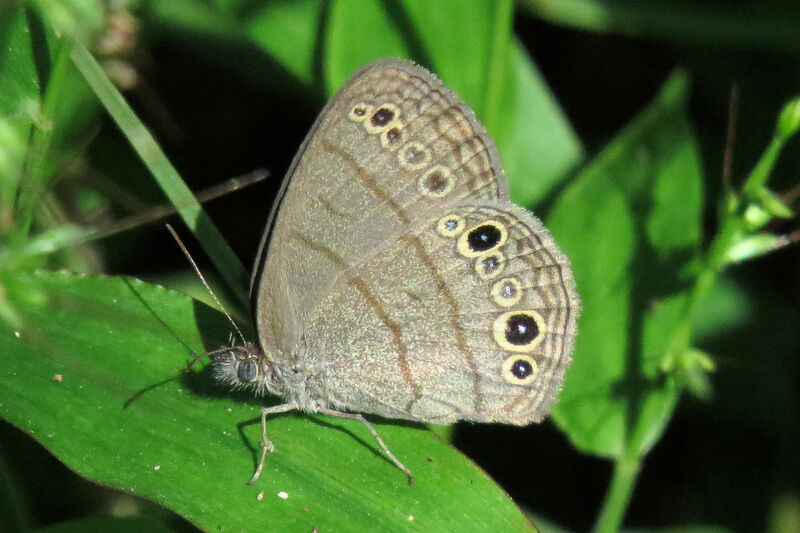 Also, the post-median band on the hind wing of Intricate Satyr is normally straight at the coastal end and does not bend inward away from the top large black eyespot; in Carolina, the band does bend inward away from this eyespot. 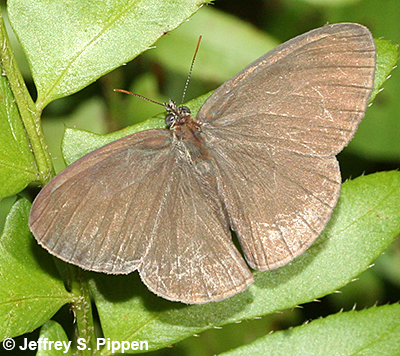 Warren points out that female specimens of Intricate show a "ghosting" of the ventral bands showing on the dorsal side of the fore wings, but that this "ghosting" of bands is not visible in males of either species nor in female Carolina specimens. However, we have never seen photos of live individuals of these satyrs with the wings spread of any ghosting of bands on the fore wings. Austin has said that female Intricates with wings spread show no such ghosting of bands in live individuals. Thankfully, Austin has noted behavioral differences in SC: Carolina Satyrs are difficult to approach, and they take flight easily, whereas Intricate Satyrs are less skittish and are easier to photograph. Comment: Island Creek, Jones Co. Note the upper surface is fairly uniform in color/tone from base to outer edge. Comment: Island Creek, Jones Co. Note the top half of the post-median line is relatively straight and without a bulge toward the body. Comment: 2018-09-22 Cordesville, SC. 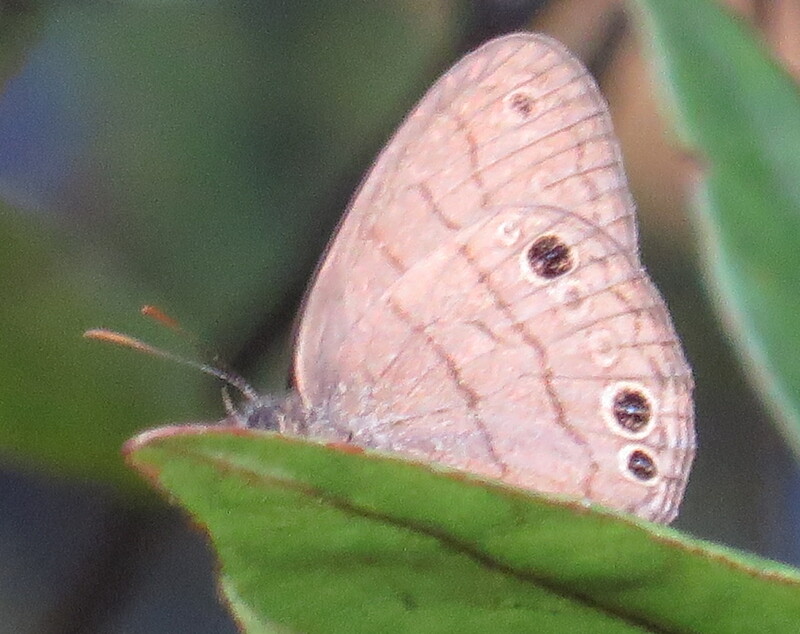 Note that the post-median band on the hindwing is essentially straight from the costal margin to beyond the first several eyespots, and thus does not bend forward (toward the base) around the top large black eyespot.